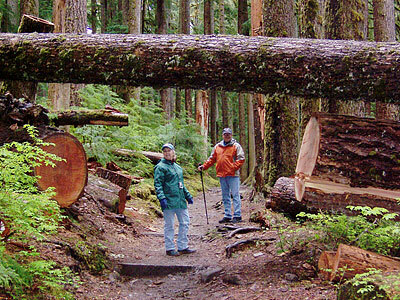 In Port Angeles a walk in the park means Olympic National Park and the choices for destinations are fabulous. Choose from simple day hikes that literally start within the city limits of Port Angeles to multi-day wilderness backpacking adventures. Hiking is a year round activity so no matter what the season there is a trail for you. Hiking is a passion for many that come to Olympic National Park and nowhere else will you find the diversity of hikes in such a short distance like you will find on the Olympic Peninsula. From the moisture-laden moss-covered trails of the rain forest, to wild trails along the ocean where the Pacific waves are crashing just steps away. Olympic National Park and the surrounding area offer something for everyone. The park encompasses over one million acres with the majority holding a wilderness designation. For the backcountry hiker/camping enthusiast there are few better places to get away from it all. There are state, county and national campgrounds scattered all through the Olympic Peninsula, giving you the opportunity to choose from a mountain setting to a campsite within ear shot of breaking waves. The Olympic Peninsula offers habitat for thousands of birds from over 200 different species and you are almost guaranteed to see a majestic Bald Eagle. 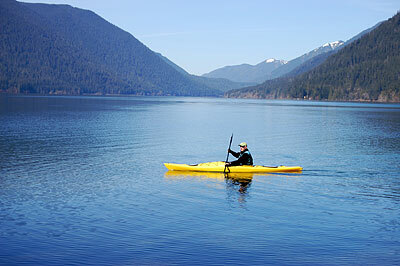 Kayaking is one of the more popular active oriented family outings in the Port Angeles area. Port Angeles has access to flat water, white water and sea kayaking. Blessed with a location of mild seasonal swings, Port Angeles offers year-round golf at several courses all with very competitive rates. Port Angeles offers wonderful fishing. Within a short amount of miles you can test your skill in salt water, lakes, streams, rivers and even catch shellfish. The Strait of Juan de Fuca offers huge halibut and salmon. Shellfishing is also very popular and crabbing for the famous Dungeness is a passion for many. The area offers fantastic river fishing. The Dungeness, Elwha, Bogachiel and Sol Duc rivers are all short drives from Port Angeles and there are several areas where you can put-in with drift boats or walk to the river for wading access. The temperate climate of Port Angeles begs you to be outdoors any month of the year. However when inclement weather arrives, there is a craving for inside activity and the area provides many options. Perfect for a family outing, bowling is always a great choice. The Clallam County Family YMCA & Anytime Fitness offers day passes and welcomes visitors. At these facilities you will find cardio equipment, free weights, and a variety of exercise classes. The Y also has basketball and racquetball courts. Gaming and entertainment abound. East of Port Angeles is 7 Cedars Casino, a Vegas-style casino with craps tables, poker room, roulette wheels, keno boards, slot machines, card tournaments and special events, including shows by nationally recognized performers. There are full-service restaurants, deli, gift shop and a smoke shop. Just west of Port Angeles you will find The Lower Elwha River Casino. The Elwha River Casino offers 7000 square feet of FUN – with over 100 electronic slot machines, and a full service deli. Active and retired professional musicians from all over the Olympic Peninsula come together to perform as the Port Angeles Symphony Orchestra. World-class guest artists regularly join the local ensemble. Port Angeles Light Opera Association will be performing their 28th production this summer. PALOA players provide year-round entertainment. PALOA singers can also be booked for events or meetings. The Community Playhouse provides a stage for the Port Angeles Community Players. The local thespians put together an annual five-play season between September and June. Nearby Sequim is home for the Olympic Theatre Arts, offering four evening and matinee performances each year during the same season. Lovers of the silver screen have Deer Park Cinema on the east side of Port Angeles offering five theatres. Deer Park Cinema is a modern, locally owned movie theater showing 1st-run films on 4 screens. Throughout the year special performances presented by the Juan de Fuca Festival showcase global talent and use the quality facilities of Peninsula College or the Port Angeles High School.